Looking for an engaging way to help your bilingual students master suffixes? This resource focuses on one common suffix found in Spanish. 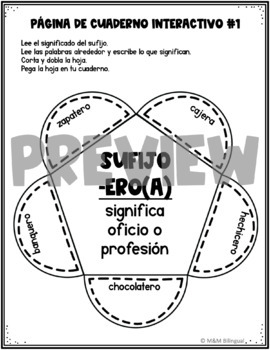 Trabajando con sufijos -ero-1 anchor chart to help introduce the suffix to the students. Teacher can post this and students can glue in their interactive journal. Looking for an engaging way to help your bilingual students master suffixes? This resource focuses on one common suffix found in Spanish. Trabajando con sufijos -oso-1 anchor chart to help introduce the suffix to the students. Teacher can post this and students can glue in their interactive journal. Looking for an engaging way to help your bilingual students master suffixes? Each resource focuses on one common suffix found in Spanish.